The three suspects captured on video surveillance robbing the Inycle store, then running over a female employee, were taken into custody yesterday in the cities of Frazier Park and Taft. 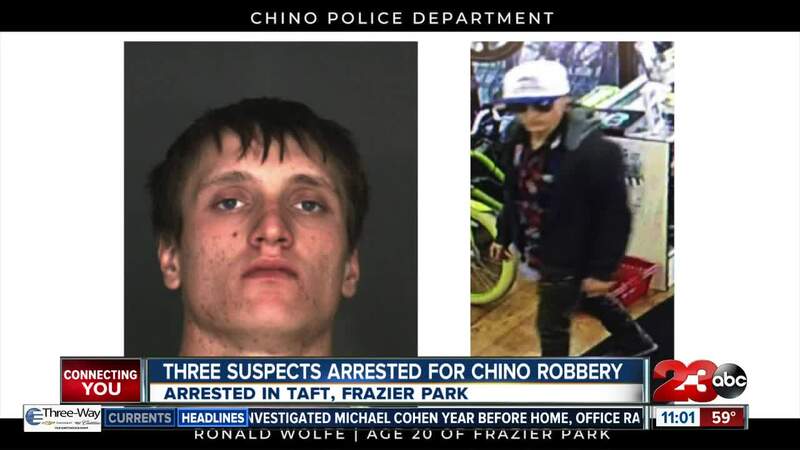 CHINO, Calif. — One man from Frazier Park and two people from Taft have been arrested after allegedly robbing an Incycle store in Chino and running over a store employee. According to the City of Chino Police Department, around 4:17 p.m. on Tuesday, February 12, two men walked into the Incycle located at 12345 Mountain Avenue in Chino and took a bike valued at $10,000. The two took off in a 2011 GMC Sierra truck driven by a woman. A female employee attempted to stop them when she was run over, suffering critical injuries to her head and torso. Images and video of the suspects were captured by surveillance cameras. The City of Chino Police Department has identified Ronald Wolfe, 20, of Frazier Park, Kyle Stewart, 27, of Taft, and Nichole Stewart, 23, of Taft as the three people involved in the robbery. All three were arrested yesterday in the cities of Frazier Park and Taft and have been booked at the West Valley Detention Center for robbery, conspiracy, and attempted murder. The City of Chino Police Department says an investigation revealed the same suspects were involved in similar burglaries throughout Los Angeles and Orange Counties. The City of Chino Police Department says the store employee who was run over was hospitalized with significant injuries but has since been released.